I’m a big proponent of “having your cake and eating it too” – eating dessert and keeping health in mind. Here are two ways to do just that! FIRST, healthifying dessert – or making small but significant ingredient swaps – can help you eat cleaner and feel better about your food choices. In these recipes, I’ve swapped out three common Mug Cake ingredients – heavy cream, butter, and sugar – for 1 (just one!) Siggi’s chocolate Skyr. What is Skyr? Excellent question! Skyr is a strained yogurt made from cow’s milk that has been astaple in the Icelandic diet for more than 1,000 years. Like milk, regular yogurt is mostly water – but with skyr, that water is strained away, creating a thick and creamy consistency. Siggi’s www.siggis.com skyr varieties are pretty awesome – they have a lower sugar content, higher protein content, and simpler ingredients compared to other yogurts. Today I’m using Siggi’s Chocolate Triple Cream (YUM!) skyr, which has 9gm of protein and just 8gm of sugar per container. Talk about filling, wholesome deliciousness. SECOND, making sure your dessert is tasty and truly delicious is super (!) important so that you are satisfied. However, eating these delicious foods in a proper portion is important to sticking with our health goals. You guys know it’s important to me to make healthy eating as EASY as possible for you- it is my #1 priority. SO I’m sharing with you today three single-serving chocolate Mug Cake recipes that are healthy, decadent, and inherently portion controlled. Here they go! Cook in microwave for 2 minutes, take out for ~30 seconds to allow cake to cool briefly. Microwave for another minute. Top with last Tablespoon of chocolate chips. This post is sponsored by siggi’s. As always, all opinions are my own. 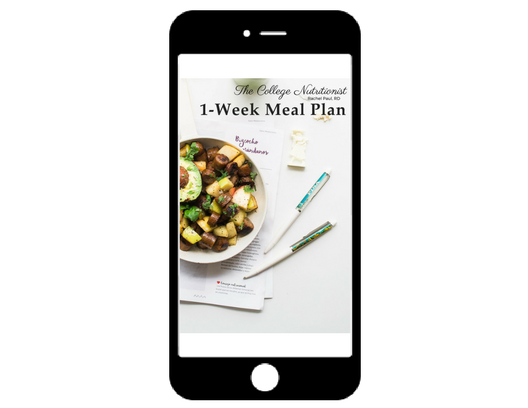 Get Your FREE 1-Week Meal Plan HERE! Subscribe to get new meal plans and my very best tips & tricks to staying healthy and fit on a budget. Your information is 100% secure and will never be shared with anyone. Unsubscribe at any time. I'm so happy you've come to my site. My goal is to help you look & feel absolutely amazing. I focus on super easy - but very healthy - meal prep, as well as strategies for sticking with your health goals in social situations and during stressful times. Welcome! Copyright © 2019 CollegeNutritionist.com and Rachel Paul Nutrition LLC. All rights reserved. College Nutritionist (Rachel Paul Nutrition LLC) website and accompanying social media platforms are written and produced for informational purposes only. This information is general, not specific to you. The information on this website does not substitute for medical or psychological advice. The reader assumes full responsibility for consulting a qualified health professional regarding health conditions or concerns, and before starting a new diet or health program. College Nutritionist and Rachel Paul Nutrition LLC are not responsible for adverse reactions, effects, or consequences resulting from the use of any recipes, plans or suggestions herein or procedures undertaken hereafter. This website contains affiliate links, which means that if you click on a product link, I may receive a commission. All opinions are my own, and all brands featured represent what I personally like and support. This website is a participant in the Amazon Services LLC Associates Program, an affiliate advertising program where I earn advertising fees by linking to amazon.com.